The answer for my previous question is Yamanaka Ino, yup, she will be the best girl for Sasuke. Ino also interested with Sasuke just like Sakura, but Ino has to save her feeling deeply after Sasuke threat Konoha and leave Konoha for joined with Orochimaru. 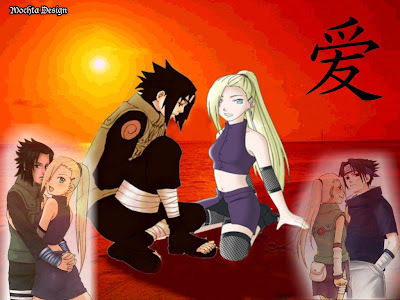 And if Sasuke and Ino could be a couple of love, this will be good solution for Shikamaru too. Because he just has one choice left, Temari. So there is no one disappointed, because all of them have been found their own soulmate. I hope all of you agree with this result, if you didn't agree with this, please tell me your reason. Why? Ok just for information, there are still two couple that I wanna chose as special lovers. You will know soon. Sasuke and Ino, I don't know... I mean, Sasuke never really knew Ino, did he? ?